RANCHO CUCAMONGA — Four Lucerne Valley teachers attended Congressional Medal of Honor Foundation Character Development Program Training on Friday, November 2 at the West End Educational Services Center in Rancho Cucamonga. Teachers Cyndie McDonough, Liu Hirschhorn, Guillermo Betancourt and Victoria Kessler received the training. The full-day training course provided them with tools needed to bring the Medal of Honor Character Development Program into their classrooms. The program is a flexible, cross-curricular resource that uses the oral histories of Medal of Honor Recipients. It focuses on how students can use these examples of courage, commitment, sacrifice, integrity, citizenship and patriotism to influence change in their own communities. The Lucerne Valley educators had the honor of listening to and meeting Congressional Medal of Honor recipient Jay Vargas. During the event, Mr. Vargas told his personal story about his experiences growing up as part of an immigrant family and sharing his thoughts on courage and commitment. Mr. Vargas was a Marine Officer who saved his wounded battalion commander and seven other Marines during a combat battle in Vietnam in 1968. Wounded, he refused to leave the field of battle until his injuries compelled him to do so. In May of 1970, President Richard M. Nixon presented then Major Vargas with the nation’s highest decoration for military valor, the Congressional Medal of Honor. The Medal of Honor Character Development Program is a resource that provides students with opportunities to explore the important concepts of courage, commitment, sacrifice, patriotism, integrity and citizenship and how these values can be exemplified in daily life. In the elementary school setting, this classroom-tested teaching resource focuses on values. On the middle-high school level, cross-disciplinary lessons will infuse courage, commitment, integrity, sacrifice, citizenship, and patriotism. The program will be used in conjunction with Positive Behavioral Interventions and Supports (PBIS) in Lucerne Valley schools. 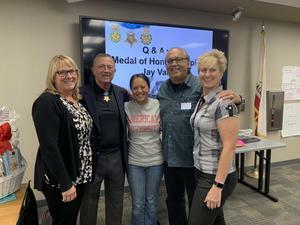 PHOTO: Lucerne Valley teachers Cyndie McDonough, Liu Hirschhorn, Guillermo Betancourt and Victoria Kessler are joined by Congressional Medal of Honor recipient Jay Vargas during their training session Friday in Rancho Cucamonga.